1. Be careful while purchasing pork for this dish. You have to make sure that the meat is fresh and having a little fat. 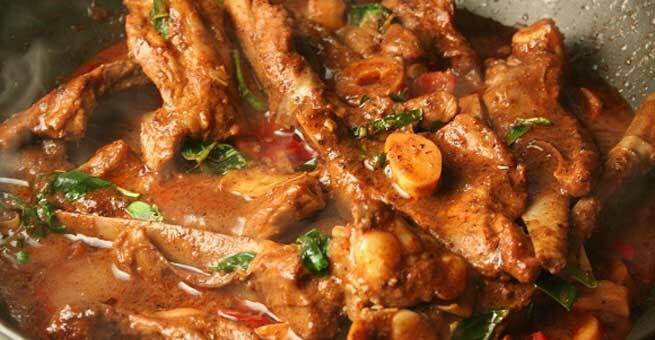 If you go for lean pork, you will not get that fat which is required for making the food tastier and more flavorful. However, start with cleaning and washing the pork meat in a proper manner. Separate the fat from rest of the meat by using a sharp knife and make 3 to 4 medium-sized pieces of it. Also, cut the meat into small cubical chunks. If you wish, you can also slice up the pork meat finely across its grain. In this case, it should be julienne cut and the meat slices must be 1(1/2)” in length. 2. 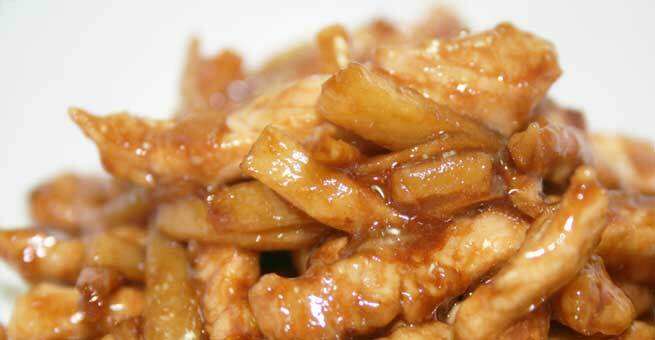 Cut bamboo shoots into thin medium-sized pieces. Try to slice them up in such a manner that they go well with the meat pieces. Peel the onions and cut them into long thin pieces. Pound the ginger. Also, deskin the garlic cloves and mash them coarsely. Then, blend the ginger and the garlic to form an uneven paste. 3. Put the whole dried red chilies in a grinder and prepare another paste by using a little water. If you wish, you can also replace whole red chilies with red chili flakes. 4. Now, take a large pressure cooker and place it on the oven over medium heat. Once it gets warm, lay the clean and washed fat pieces at its bottom. They will start to melt soon. So, take a spoon and keep stirring so that the pieces do not get stuck to the bottom of the cooker. As the fat pieces release oil, their color changes from bright golden brown to nice and soft light brown. Wait for some more minutes and let the oil come out completely from the fate pieces. 5. Put onion slices in the oil and sauté until they become soft as well as translucent. Add the meat pieces to the onions and set the flame to high. Allow it to cook for quite some time. Stir fry occasionally. As soon as the onion and the meat start releasing oil, reduce the temperature and add the ginger-garlic paste to the cooker. Blend all the ingredients together so that the meat gets well-coated with the paste. Put the lid of the cooker and wait for a couple of minutes. 6. Next, remove the lid of the cooker and add the red chili paste to the meat. Set the temperature to medium-high and stir fry for some time. Again, place the lid over the cooker and adjust the flame to low. 7. 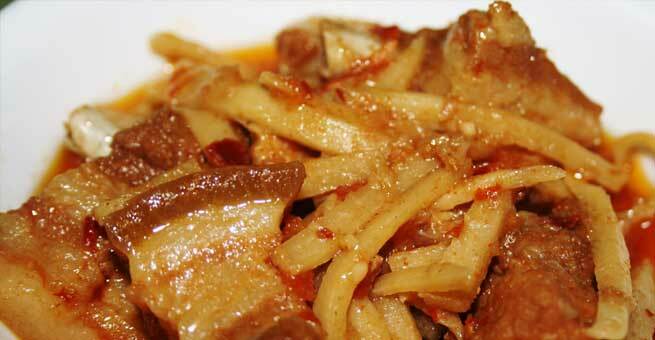 After some time, add the bamboo shoot slices to the half-cooked meat and combine them with the help of a spoon. Keep the cooker covered for at least 5 to 7 minutes and let the entire thing get cooked at low flame. A nice aroma will come out of the cooker at this stage. 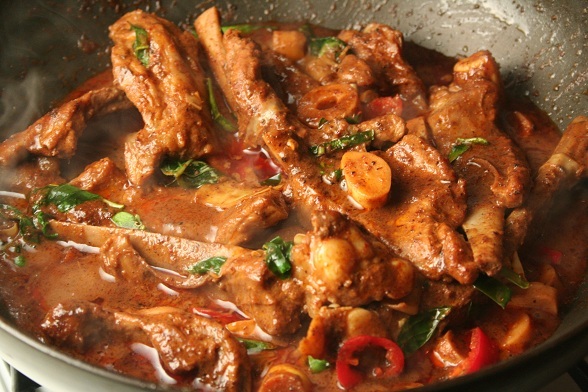 When the meat and the bamboo shoots will be about to melt, add some salt and hot water to them to prepare the gravy. 8. Set the flame to high again and wait until the entire thing gets a tempting golden brown color. Leave the gravy for boiling. You need to pressure cook it for a moment. So, do not forget to put the lid over the cooker tightly. After 3 to 4 whistles, turn off the oven and take the cooker out of it. 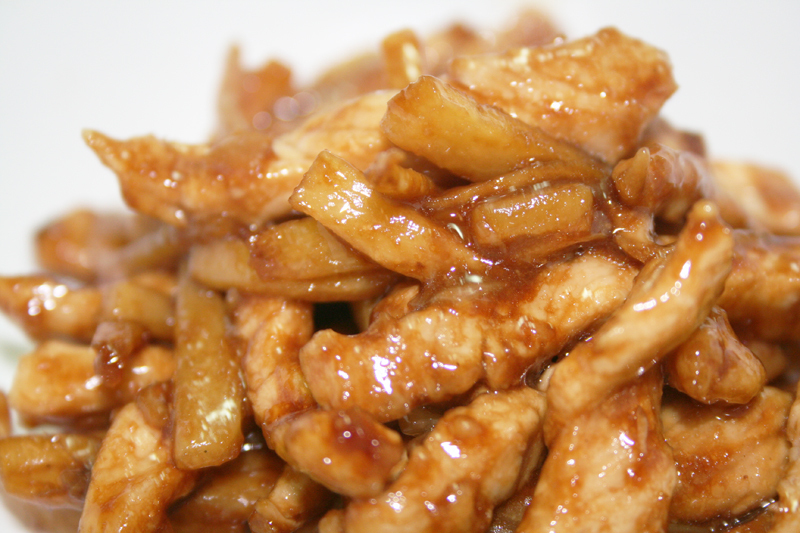 Your mouthwatering pork with bamboo shoots is absolutely ready. Just garnish with freshly chopped coriander leaves and serve hot!